DID YOU KNOW that photography was the first art form women were actually encouraged to explore during the nineteenth century? At that time, women were not allowed to study in most academic art schools. Have your students make up a list of famous women photographers from the last century and a half. What factors do you think influenced the fact that so many women become documentary photographers? Like Dorothea Lange, Berenice Abbott, and Margaret Bourke-White, Consuelo Kanaga was an important documentary photographer in the middle of the 20th century. Unlike her contemporaries, despite a successful career of sixty years, Kanaga received little public acclaim or critical success during her long career. Her political and social ideologies guided her art. At a time when most social commentary in photography involved images meant to shock the viewer into action, Kanaga’s images seduced the viewer with careful composition, intuitive cropping, and reframing. Born in Oregon in 1894, Kanaga first began taking pictures in 1918 as a staff photographer for the San Francisco Chronicle. Though self-taught, she became a master printer. She was particularly influenced by the photographs of Alfred Stieglitz, whose work she saw and admired in his journal “Camera Work.” At the same time, Kanaga was deeply committed to radical politics—a passion that began in early childhood. As a newspaper photographer in California and later as a documentary photographer in New York in the early 1920s, Kanaga recorded rural and urban poverty, displaced children and mothers, and labor unrest. During the late 1940s and early ‘50s, Kanaga traveled throughout the South recording the difficult lives of black migrant workers. Kanaga’s work appeared in only ten group and six solo exhibitions during her lifetime. At the time of her death, her entire estate was assessed at $1,345 (for 2,500 negatives, 375 prints, and miscellaneous photographic equipment). This link is great, includes brief bio, poster and photo links. Connections Across Curriculum - Viewing the world through a camera lens is an engaging learning experience. Photographers can capture a moment, shed light on a situation, and explore the world around them as photojournalists. Students can use photojournalism skills to learn the technical aspects of the medium, analyze a variety of situations, and express themselves through storytelling. The New York Times provides resources for incorporating photojournalism into your curriculum. I didn't realize that the NYT includes lesson plans based on the news. Great to know. 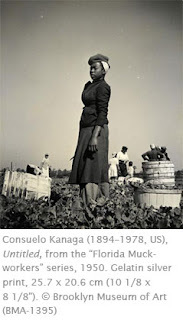 Very interesting learning about Consuelo Kanaga, and women photographers in general.